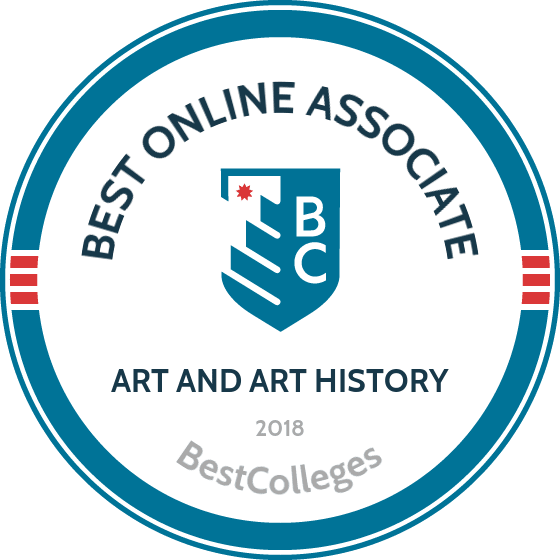 What Are The Best Online Associate in Art & Art History Programs? What Else Can I Expect From an Online Associate in Art & Art History Program? What Can I Do With an Associate in Art & Art History Degree? The study of history offers insight into the lives of people in places across the world, both past and present. Art history engages in the intimate exploration of civilizations, communities, and individuals through visual culture, including religious artifacts, luxury items, and commemorative memorabilia. In our modern world, we are surrounded with visual messages that impact our daily lives, from advertisements to propaganda. An online art history associate degree attunes you to those messages, allowing you to consciously absorb, critique, and respond to contemporary visual expression. Located in the Bay Area, Foothill College is one of the Golden State's best community colleges. The school recently expanded its distance learning department, which now offers several programs, including an online art history associate degree. Students must complete a total of 90 units over the course of two years. Required courses include Asian art, western art, and the history of women in art. For students hoping to continue their studies at a four-year university, Foothill recommends that they also complete one or two years of a foreign language. Foothill's art history program delivers coursework asynchronously through the Canvas learning platform. Though out-of-state students pay higher tuition, the non-resident tuition rate is still affordable. All transfer students must take assessments in Math and English, or submit proof of coursework at another college to fulfill prerequisites. Maintaining 11 campuses throughout the state, Colorado Mountain College's primary focus is providing affordable education to mountain communities. The school recently expanded its distance learning offerings, bringing affordable programs to students nationwide. The school's online associate degree in art history requires students to complete at least 60 credits in areas such as ancient and medieval art, Renaissance art, modern art, and drawing. Students in the program complete asynchronous coursework through Basecamp. The advantage of the online art history associate degree at Colorado Mountain College is the ease with which students can transfer their credits to four-year programs. CMC maintains articulation agreements with every state university in Colorado, and some students have even transferred their credits from CMC to Ivy League schools. Primarily serving the area in and around Iola, Kansas, Allen Community College now offers a number of its programs online. One such program is the online AA degree with an emphasis in art, which requires students to complete a total of 64 credits over the course of two years. Unlike art history programs, Allen's program focuses on the creation of art, and students take courses in painting, digital photography, design, and drawing. Students also complete a course in public speaking to ensure that they can satisfactorily present their art to different audiences. Since students study a wide range of art forms, they can find careers as graphic designers, illustrators, fashion designers, and art directors. The school's articulation agreements with seven Kansas state schools — including Kansas State, Kansas University, and Wichita State — allow students to continue their art education in a bachelor's program. For admission to Allen, students must complete online application and placement tests. Essex County College prides itself on its open doors policy, which means the school makes its online AA in art program as accessible as possible. Based in Newark, New Jersey, the school requires students to complete a total of 66 credits that mirror the first two years of a bachelor's degree in art. Students in the program complete coursework in a range of artistic disciplines, including art history, painting, 3D design, drawing, and computer art. Essex maintains articulation agreements with most New Jersey state universities, allowing its students to transfer their credits to in-state four-year schools, including Rutgers, Fairleigh Dickinson University, and the New Jersey Institute of Technology. The program includes options for face-to-face, hybrid, or online asynchronous courses, which the school delivers through the Moodle platform. Operating five instructional sites in the Eastern Sierras of Southern California, Cerro Coso also offers numerous online programs. One of the school's strongest online programs is its AA degree in art history, which the college designed specifically for students who plan to earn a bachelor's degree. Students who complete their online art history associate degree at Cerro Coso receive guaranteed admission to any four-year school in the California State University system. Cerro Coso's art history program covers a wide range of topics, preparing students to earn their bachelor's degrees in art history, studio arts, fine arts, art education, and art therapy. Students complete a total of 60 credits, including courses in drawing, modern art history, and sculpture. Out-of-state students pay a higher tuition than in-state residents. The program delivers coursework both synchronously and asynchronously through the Canvas learning platform. An online art history degree introduces you to art movements and cultures across the world. This foundation helps students cultivate critical interpretive skills and cultural sensitivity. Ultimately, the associate degree prepares students for higher levels of education, such as a bachelor's or master's degree. Though courses vary between programs, most online art history degrees prioritize historical art surveys that introduce students to field discourse and analysis. The following list reviews common core classes that you'll find in most associate programs. Survey of Ancient Art: From the Egyptians and Mesopotamians to the Greeks and Romans, the survey of ancient art introduces students to the stylistic individualism and cultural priorities of ancient communities across Europe and the Middle East. Here, you can explore the religious practices, culturally constructed identities, and political imagery of ancient worlds. Survey of Renaissance Art: Donatello, Botticelli, Leonardo da Vinci, and Michelangelo are all famous artists from the Italian Renaissance. You can learn about these great artists, their patrons, and the intellectual foundations of the era, including humanism. Survey of Modern Art: Dive into recent art history in this survey of modern art. Typically covering the late 19th and first half of the 20th centuries, this class covers painting, architecture, and sculpture across modernist movements, including Impressionism, Art Nouveau, Minimalism, and Pop Art. Japanese Art: Take a cultural survey of the history of Japanese art and you can examine cultural trends in visual objects, from tea houses and hanging scrolls, to woodblock prints and manga. This course exposes students to a culture with its own innovative approach to art. History of Photography: Materially based courses, such as the history of photography, look at the evolution of an artistic practice and its reception over time. Though it began as an under-appreciated medium, photography has become a hallmark of our modern culture, shaping our daily lives, and the field of art history itself. How Long Does it Take to get an Online Associate in Art & Art History? An online associate art history degree typically takes two years to complete, if you take an average of four or five courses each semester. The benefit of online coursework, however, is that you can enroll in the number of courses that best suits your current situation. Students with full-time jobs or families can choose to enroll in fewer courses per term, increasing the length of the degree, but allowing them to fit coursework into their busy schedules. Some associate degree programs offer different forms of course enrollment. Individual or self-paced enrollment allows you to complete a course at your own pace, with online assistance from professors when necessary. By contrast, cohort enrollment (also termed cohort learning) syncs online courses with the institution's quarter or semester term schedule. The benefits of cohort learning include classmate interaction and feedback, as well as accountability and structure to help you stay on track to complete your degree. Once you have decided to pursue an associate degree, it is important to look for an accredited institution. Accreditation means that your chosen school offers a strong educational foundation that is recognized regionally or nationally, and ensures the quality of your background to future employers. In short, your associate degree is only as valuable as your school's accreditation. College and university accreditations are monitored by the U.S. Department of Education (ED), a government agency dedicated to maintaining high standards of learning across the country. The ED authorizes six regional accreditation boards to monitor local institutions, including the New England Association of Schools and Colleges, and the Higher Learning Commission. Additionally, a consortium of colleges and universities across the country voluntarily self-regulate as members of the Council for Higher Education Accreditation (CHEA). As you search for associate degree programs, be sure to check each school's accreditation, or search schools directly on the ED and CHEA websites. An associate degree in art history can prepare you for future study and potentially a professional position in the field. Coursework offers a comprehensive framework to understand the evolution of art production and innovation across history. If you want to delve deeper into art history (a specific time period, artist, or movement, for example), consider transferring your associate credits into a four-year bachelor's degree. Most associate degree programs are designed to make this transition. Check with your potential institution for transfer requirements and four-year institution affiliations. Bachelor's in Art History: Continue your study of cultures and art movements with a bachelor's in art history. Upper level courses in this degree allow in-depth investigations of cultures and artists, such as Michelangelo, Victorian Britain, or prehistoric Chinese bronzes. Bachelor's in Studio Art: Use your knowledge of art history to create new works of art as a studio art major. Studio artists hone their artistic voice through a specific medium, such as painting, pottery, glass blowing, or photography. See where your imagination takes you when you combine historical art knowledge with studio practice. Bachelor's in History: For those more interested in general history, consider transitioning into the field directly. History students trace the past, evaluating nations, political systems, and the lives of everyday people. Bachelor's in Classics: Interested in learning more about the ancient cultures that shape much of our modern world? Consider a degree in the classics, where you'll study classical languages like Greek and Latin, cultures like the ancient Mesopotamians and Celts, and the cosmopolitan worlds of Rome and Alexandria. Master's in Art History: Once you've earned your bachelor's, continue on to the master's in art history. Become a specialist in a particular field of art, such as ancient, Renaissance, or modern art history, with a two-year master's degree. Master's programs usually require two years of language courses in a language useful for personal research. Students who earn an online art history associate degree gain useful skills across multiple professional realms. Art historians are attentive to detail, and they focus on questions of chronology, quality manufacture, and cultural value. As a result, art historians make valuable administrators and organizers, bringing the innovations of companies and organizations into focus. The following list details just a few of the many positions available to art historians. These professionals work next to great works of art in a museum setting. Most positions require a bachelor's degree. These managers organize an organization's support system as an administrative services manager. These managers monitor organizations to ensure facility safety and maintain a productive business environment. This position typically requires a bachelor's degree. Put your knowledge of past and present art movements to work as a fine arts craftsman. Use your artistic skills in painting, weaving, carving, or printing to create new works of art. Though salaries depend in part upon where you live, the averages listed in the following table offer general salary guidelines for positions open for those who have earned an art history degree online. These statistics are based on individually reported, full-time salaried positions, and demonstrate general positive trends in salary with increased experience. Once you have selected your online program, you should determine how to finance your online art history degree. Be sure to apply for FAFSA, the Free Application for Federal Student Aid. This application tells you what government resources are available depending your situation, including subsidized and unsubsidized loans, scholarships and grants, and work study. If you are offered both subsidized and unsubsidized loans, always prioritize the subsidized ones because they do not accrue interest as long as you are enrolled at least part-time. Also, check with your school for merit- and need-based scholarships and grants.